Justin Somper is the bestselling author with the Vampirates sequence. The first title, Vampirates: Demons of the Ocean debuted in 2005 and has sold over 100,000 copies to date in the UK. Justin was dubbed “The Next Big Thing” by Sunday Times Magazine while, in Waterstone’s “Harry Potter Report”, the chain’s buyers selected Demons of the Ocean as their top recommendation for fans of Harry Potter. The Sunday Times said Vampirates “promises to be an addictive series”. The Evening Standard welcomed “a vivid and bloodthirsty debut”, whilst The Times acclaimed “a clever combination of two genres that could make it as popular as Pirates of the Caribbean”. WHO’S A BUSY BEAVER THEN? As if writing each book in the sequence isn’t enough, Justin also finds time to reply to the comments and queries left by his readers on vampirates.co.uk and Facebook. To celebrate a launch of VAMPIRATES: EMPIRE OF NIGHT, Justin participated in a live event with bittenbybooks, where he chatted live on-line with fans globally. Traveling to festivals, schools and libraries is a highlight of Justin’s year, when he gets the opportunity to meet avid readers and aspiring young writers. Since the publication of Vampirates internationally, Justin has completed events throughout the UK, in France, Australia, Sweden, and the USA – where it’s not out of the question for fans to drive across state lines for the chance to meet Captain Somper! On the lookout for more stuff? Why not sign up to the VAMPIRATES CREW – you’ll get Justin’s newsletter, have access to exclusive competitions and hot news before anyone else! See what Justin has to say for himself when faced with tough questions on writing Vampirates, sword-fighting, and the things he couldn’t possibly live without. Justin talks about the world of the Vampirates and shows us around his writer’s den – where the magic really happens! The brand-spanking, chock full of good stuff, JUSTIN SOMPER WEBSITE will launch in JULY 2012. Be sure to check back in a few short weeks for some EXCLUSIVE news about Justin’s LATEST WRITING PROJECT! It’s always great to welcome a new children’s bookshop, especially in these challenging economic times and even more so on your very doorstep. So Justin was absolutely thrilled to join the celebrations for the opening of Pickled Pepper Books in Crouch End, North London. The store opened to the public on July 7th and looks set to be a truly vibrant addition to the area. At the launch party on Wednesday evening, Justin caught up with fellow local authors Karen McCombie (who will be signing her latest book at the shop on Saturday @ 11:00 am), Fiona Dunbar, Joe “Jimmy Coates” Craig, Kate Umansky and illustrator Steven Lenton. If you’re based in North London, or thereabouts, do check out the new shop and spread the word. You never know – you might even bump into Justin himself, browsing the shelves! And if you would like a signed copy of one of his books, you’ll only have to ask them and he can sign it for you when he next passes by! Which is the best Vampirates book on the planet? I will be sure to look for them. and have gotten to meet all those authors!! And to get Justin to sign my books would be AWESOME!! “The ride is far from over”!!! 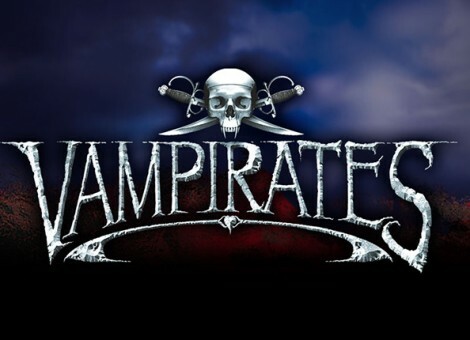 JOIN THE CREW AND WIN EXCLUSIVE VAMPIRATES SWAG! Attention all crew members! Even if you were previously a Vampirates VIP, you still need to JOIN THE CREW at the new www.vampirates.co.uk so we can continue to send you regular newsletters with the all-important VAMPIRATES news as well as exclusive competitions, only for you. To reward you for your efforts, we have a host of exclusive prizes stashed away in the hold. The first fifteen crew members who signed up have won a funky double-sided VAMPIRATES poster, signed by Captain Somper himself. The 50th crew-member won a signed copy of a VAMPIRATES book. And the 101st crew-member to sign up won a pirate flag, used by Captain Somper himself at events... personalised by the Captain! Now we are offering a prize for the 250th crew-member to sign up... TWO signed copies of a VAMPIRATES book of your choice (one for you and one for a friend) in a language of your choice*. You have 26 languages to choose from. If we had to recommend one, we’d have to plump for the gorgeous Japanese editions. Even if you don’t understand a word of the text, there are great line illustrations throughout and this would be a really nice addition to your VAMPIRATES collection. To be in with a chance to win, all you have to do is JOIN THE CREW. If you are one of the lucky winners, VAMPIRATES HQ will be in touch by e-mail. Watch this space for more prizes as the crew builds in number! *subject to availability. Illustrations by Kev Walker and Bob Lea. Logo design by Blacksheep.